There were many scenes like this across the country when the supporters of opposing political parties came together to enjoy the day. Caption: Bruce or Portia, Nuh watch nuh face ...ONE BLOOD! We a fren! Caption: So we fi liv good. She by yu side and me have yu back." Caption: Out of Many we are one. 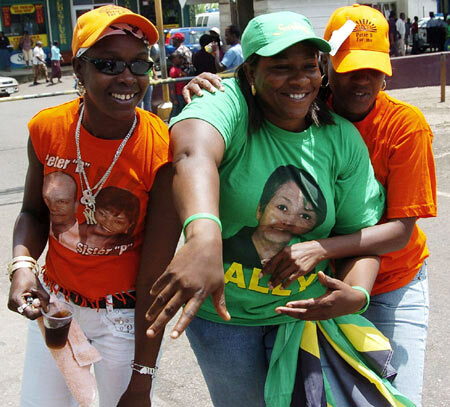 PNP and JLP one goal for a better jamaica. Caption: Friend,through thick and thin....showing our politicians how it should really be done. Caption: One Love One Heart...One Nation. Out of many one people, despite your political preference...we are one big family! Thank you for the 163 responses we received. Enter again and we hope you will be the outright winner next time.